Offering improved power density, compared to previous designs, through the use of bonded neodymium magnets, the 8540 DC servo motors also provide twice the continuous torque rating. Manufactured by Pittman, they are 30mm in diameter and are available in three lengths; 53.69, 65.66, and 77.65mm. Depending on the model, torque ratings from 0.018 to 0.059Nm can be achieved without the use of a heat sink. The motors come with 8 standard windings from 9.55 to 48V. Customized windings can be designed to optimize performance for a specific application requirement. The motors have standard pre-loaded ball bearings, allowing high speeds, radial and axial shaft loading, and higher temperatures. A new bearing support system, a 7 slot armature, and improved manufacturing techniques allow more balanced armatures resulting in very low vibration and audible noise characteristics. 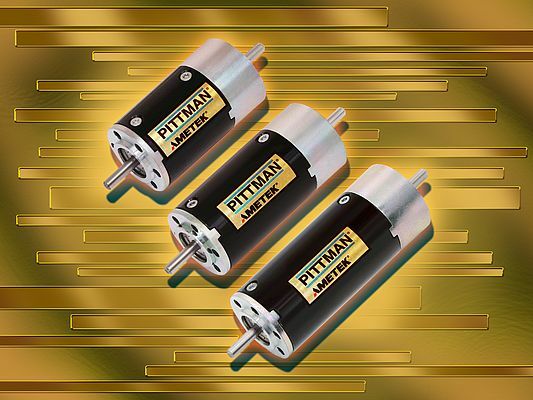 At low speeds, the motors exhibit very low cogging as a result of a optimized magnetic circuit design. Complementary products include gearboxes, encoders, and brakes. The motors have the capability of extensive customization including shaft configurations, leadwire assemblies, optional EMI/RFI filtering components, transmission components (shaft gears, pulleys, or sprockets) and a variety of brush materials (including standard graphite).